Register for our NEW Project Management Simulation Course Today! Discover how each decision impacts each key area and the overall project. 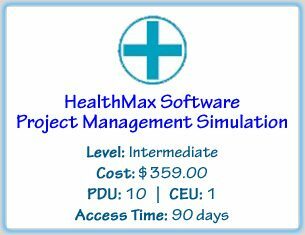 HealthMax Simulation is an online, self-paced simulation course that le you develop your project management skills in a risk-free environment. The choices you make and the feedback you receive are based on the nine knowledge areas of A Guide to the Project Management Body of Knowledge (PMBOK Guide®). Balancing competing interests, such as project scope, quality, schedule, budget, resources, risk, communications, and procurement considerations. Dealing with controversial decisions and the potential for negative team or customer outcomes. Analyzing schedule, budget, and quality data and using that information to make educated decisions. Addressing issues related to project procurement. Facing challenges related to project planning, project execution, and project monitoring and control. Participants who successfully complete the course will receive a certificate of completion for 10 PDU’s and 1 CEU. This course is a part of the Project Management courses available for PDUs, and can be taken individually or as part of the suite for a discounted price. For a limited time, receive 20% off your order of any of our Online Business Skill Courses now through March 18th. Visit our promotions page for more information. Try our PMP Exam Prep Demo! If you have any questions about this or any other course, please contact us via email at learn@corexcel.com or 1-888-658-6641 (Mon-Fri, 9am – 5:30pm Eastern Time).